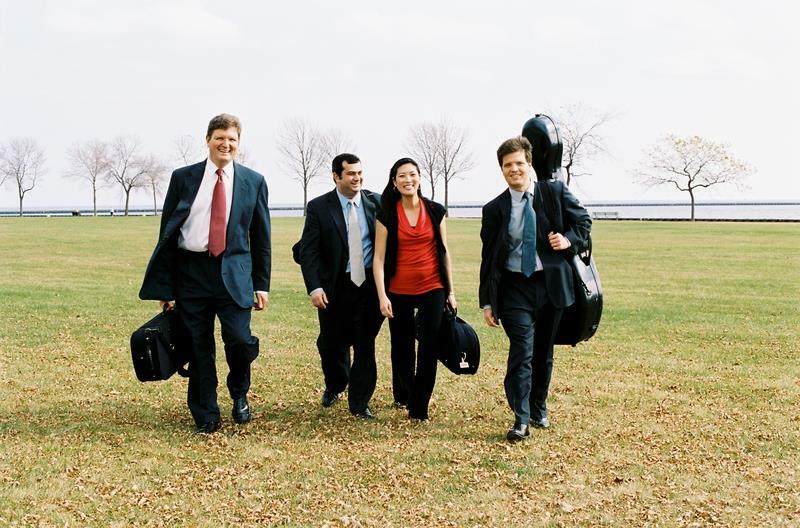 The Philomusica Quartet, continue their concert series on Monday evening with a program featuring some of the best of chamber music: works by Mozart, Brahms and Dvorák. The Philomusica (violinists Jeanyi Kim and Alexander Mandl, violist Nathan Hackett and cellist Adrien Zitoun) will be joined for the a Dvořák piano quintet by Yaniv Dinur, Associate conductor of the Milwaukee Symphony Orchestra and an accomplished pianist. Mandl notes that Dinur brings a valuable perspective to interpreting the Dvořák, drawing upon his knowledge of the composer’s orchestral works. As Western classical music evolved, composers tended to dwell on new perspectives, dismissing much of what had been written before their time. Wolfgang Amadeus Mozart was one of few composers in the 18th century to recognize the greatness of J.S. Bach’s work several decades earlier. (His son, C.P.E. Bach was far better known in Mozart’s time.) Mozart was given access to a library of J.S. Bach’s compositions. Spurred by his wife Constanze’s interest as well, he explored the fugal writing of J.S. Bach, then wrote several works emulating what he found. Arranged from a work first composed for two pianos, Adagio and Fugue in C minor, K.546 opens with a light adagio in the form of a French dance suite, then launches into an energetic fugue. It’s a throwback to Baroque style, and not the only example from Mozart, who also featured a grand triple fugue in the conclusion of his Jupiter Symphony. To Mandl, the evening should have included Ludwig van Beethoven‘s String Quartet No. 10 in E-flat major, “the Harp.” Beethoven’s look back at Mozart’s compositions inspired Brahms, who revered Beethoven. Dvorak, whose writing was in turn inspired by Brahms, incorporated the earlier fugal structure into his piano quintet. The title of Monday night’s concert, Admiration and Reverence, invites the listener to hear the connections between these pieces. As the Beethoven did not fit into the full evening, readers are invited to check it out before the concert. The two major works on the program are each masterpieces in the repertoire. Johannes Brahms was such a perfectionist, it is thought he may have trashed as many as 20 string quartets before choosing to publish one. His String Quartet No. 3 in B flat major, Op. 67 stands out as an advanced work. Mandl observes that the quartet is restrained in its dynamics. Brahm’s mastery of subtle development advances the music both through basic thematic material but also by inventive use of accent marks and rhythmic shifts. Critic Misha Amory writes that “Especially in its outer movements there is a feeling of the countryside, of sunshine. The first movement has strong ties to the same movement of Mozart’s ‘Hunt’ Quartet. Aside from sharing its key and its meter — fairly superficial traits — the Brahms evokes the atmosphere of the hunt from the very opening, imitating hunting horns perhaps even more faithfully than Mozart’s music.” An aria for violin is featured in beautiful second movement. The viola sings above three muted instruments in the third. A sense of restlessness created by overlaying duple and triple meters expands the number of voices we hear. The finale offers a set of variations strongly paralleling the closing of Beethoven’s Harp quartet. Perhaps the listener will not pick up on the threads that join the works carefully selected for this concert. But the works by Brahms and Dvorak each stand out as masterpieces worthy of an outstanding concert. Monday’s February 6th concert begins at 7:30 p.m. at Wisconsin Lutheran College’s Schwann Concert Hall, located at 8815 W. Wisconsin Avenue, Milwaukee. General admission tickets ($25) may be purchased at the door or in advance through the Wisconsin Lutheran College box office web site or at 414-443-8802. Student tickets are available for $12. A three story parking garage just east of Schwann Concert Hall offers free parking. The Philomusica’s next concert, at Wisconsin Lutheran College on April 23, 2018 will feature works Arvo Pärt, Debussy, and Tchaikovsky.